In preparation for Science Online 2011, I was asked by Mark Hahnel from over at Science 3.0 if I could do some analysis of the blogs that they’ve been aggregating since Octobor (25 thousand posts from 1506 authors). Mark along with Dave Munger will be talking more about the role/importance of aggregators in a session Saturday morning 9am (Developing an aggregator for all science blogs). These analysis provide a high level overview of the content of science blogs. Here are the results. 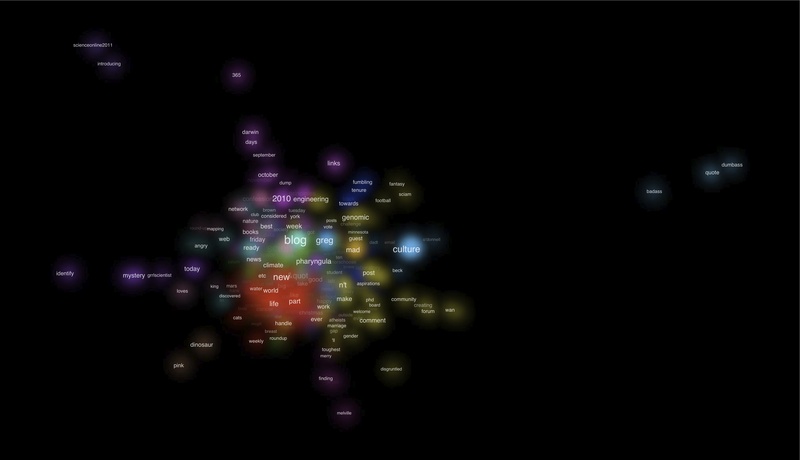 The words cluster together according to their co-occurrence. The hotter the color the more occurrence of those words. You’ll notice that for example Science and Blog are close to one another. Darwin and days as well as fumbling and tenure are close as well. The visualization was done with Vosviewer software. I also looked at how blogs are citing research papers. We looked for the occurrence of DOIs as well as research blogging style citations within all the blog posts. We found that there were 964 posts with these sorts of citations. In this case, I thought there would be more but maybe this is down to how I implemented it. I was quite happy with this list because they are pretty much all science links. I thought there would be a lot more links to non-science places. I hope the results can provide a useful discussion piece. Obviously, this is just the start and we can do a lot more interesting analyses. In particular, I think such statistics can be the basis for alt-metrics style measures. If you’re interested in talking to me about these analysis come find me at Science Online. In 2010, there were 12 new posts, growing the total archive of this blog to 46 posts. There were 12 pictures uploaded, taking up a total of 5mb. That’s about a picture per month. The busiest day of the year was October 13th with 176 views. The most popular post that day was Data DJ realized….well at least version 0.1. 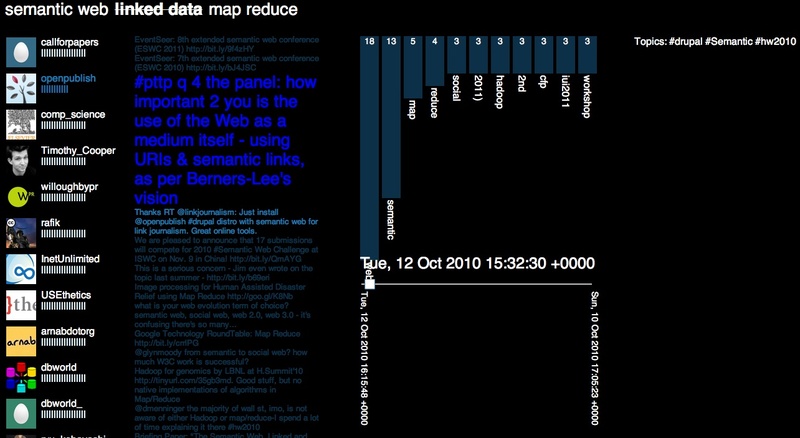 The top referring sites in 2010 were twitter.com, few.vu.nl, litfass.km.opendfki.de, 4store.org, and facebook.com. Some visitors came searching, mostly for provenance open gov, think links, ready made food, 4store, and thinklinks.